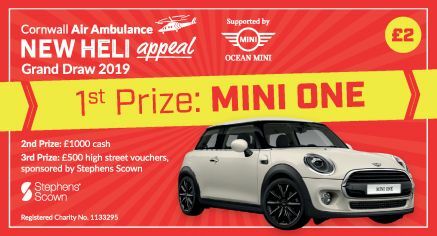 Play the Cornwall Air Ambulance Grand Draw 2019 and help save more time and more lives. Enter the Grand Draw this year and you’ll be in with a chance to take home one of three fantastic prizes, including a MINI One Hatchback! By playing the Grand Draw you can help to save more time and more lives in Cornwall in the future. The proceeds of every ticket go directly to the New Heli Appeal, to bring a bigger and faster air ambulance helicopter to Cornwall by April 2020. A head-on crash near Liskeard left two-year old Talan with head injuries so severe that he spent two days fighting for his life in a coma. "I'm so grateful to the Cornwall Air Ambulance for helping him that day and being so incredibly supportive. I can't thank them enough." Kelly, Talan’s Mum. Help keep more families like Talan’s together. Entry is simple, just click the Play Now button below. Each entry costs £2. The closing date is 9th December and the draw will take place on 13th December 2019.